Can a small handful of volunteers bring down the largest whaling fleet in the world? We have the powerful Japanese whaling fleet on the ropes and all we need to do is deliver the knock-out punch. The Japanese pirate whalers are hurting bad. They are over fifty million dollars in debt and we have stopped them from getting their full kill quota for three years in a row. Our first campaign in 2005/2006 saw us chase the fleet for 3,500 miles westward along the Antarctic coast. Although handicapped by a slower vessel we confronted them three times and we kept them on the run. We sideswiped their supply ship and forced them to return to Japan and by the end of the season, the whalers were 83 whales short of their quota. We had cut their kill numbers by 10%. We knew that we would need a faster ship if we were to return in 2006/2007. We also had the problem that our ship the Farley Mowat was placed under arrest in South Africa because of pressure from the Japanese and Canadian governments. Thus began the impossible mission of Operation Leviathan. As I searched the globe for a faster ship, Captain Alex Cornelissen deftly managed to cut the Farley Mowat out of Cape Town harbour by departing covertly at 0300 Hours in the morning, following a freighter out in the dark with all lights shut off. They then successfully eluded the South African navy escaping into the Indian Ocean. Following that daring escape the Farley Mowat weathered extremely severe weather until reaching the friendly port of Freemantle in Western Australia where the ship and crew were welcomed as heroes and Mayor Peter Tagliaferri presented us with the honour of having Fremantle declared our honourary home port. Meanwhile I had inspected a ship in Malta but it was to expensive to purchase. By June I had located a 2nd ship in Trinidad and after spending two months working to purchase the vessel we were forced to drop the acquisition due to illegalities with the ship's owner. With the next whaling season rapidly approaching, we finally found the perfect ship in Edinburgh, Scotland in October. It was the Westra, the retired Scottish fisheries patrol vessel. We bought it during the first week of November thanks to a bank loan from a very loyal and generous supporter. By mid-November the ship was in drydock and by December 5th, the Westra now renamed the Robert Hunter was heading south down the length of the entire Atlantic Ocean through the Straits of Magellan reaching the Ross Sea by January 19th, 2007. I took the Farley Mowat out of Melbourne and met the Robert Hunter in the Ross Sea where our crew constructed a helicopter deck on the Robert Hunter in only two days. Together the two ships hunted down and engaged the Japanese fleet twice. Then an accident occurred on the Japanese factory ship Nisshin Maru - a fire that killed one of their crew and crippled the ship. The Japanese whaling fleet was forced to retreat back to Japan with less than half their kill quota. More than 500 whales were spared. The Japanese government was furious and forced the British registrar to pull the Red Duster from the Robert Hunter leaving us flagless. We quickly re-registered our two ships under the Dutch flag, a nation not vulnerable to being dictated to by Japan or any other pirate whaling nation. In June 2007, I entrusted Captain Cornelissen to take the Farley Mowat to the Galapagos and then onto Iceland for Operation Ragnarok, the campaign to intervene against illegal Icelandic whaling operations. The Robert Hunter remained in Melbourne to prepare for a return to the Whale Sanctuary in December. Once again we had the Herculean task of raising the funds for the next campaign. By the time the Farley Mowat reached the Galapagos, Iceland decided to cancel it's whaling operations and the Farley Mowat turned it's attention to confiscating illegal long lines, intervening against shark poachers and stopping plans by a company called Planktos to dump iron dust into the ocean off the Galapagos. That summer we investigated and seized 45,000 shark fins and over 100,000 sea cucumbers from poachers and smugglers in Ecuador. I was awarded the Amazon Peace Prize by the President of Ecuador and a contract was placed on the heads of Sea Shepherd Galapagos Director Sean O'Hearn and myself by the sharkfin mafia of Manta, Ecuador. Sean was forced to resign at the assistance of his wife and one of our police officer supporters sent me a bullet proof vest. By the end of the year, Planktos had been stopped. Captain Alex Cornelissen took up the position of Sea Shepherd director for the Galapagos and I was ready to take the helm of the Robert Hunter for the return voyage to Antarctica in a campaign we named Operation Migaloo. In a move that the late Robert Hunter would have approved of, I renamed the ship the Steve Irwin to reflect the passion of Australians in opposing illegal whaling and to focus on the symbol of the whales of Australia – Migaloo, the beloved white Humpback whale who the Japanese said they would harpoon if they got the chance. We headed southward on December 5th after Teri Irwin officially launched the ship under Steve's name. Onboard was a film crew from Animal Planet to begin work on a series to be called Whale Wars. It was a long, dangerous, and successful pursuit as the Steve Irwin covered over 22,000 miles in three legs chasing the Japanese whaling fleet across the vast expanse of the remote and unpredictable Southern Ocean. We boarded a harpoon vessel creating an international incident that captured headlines around the world. Most importantly we shut down whaling operations to the point that once again the whalers failed to take their kill quota. Of their quota of 50 Humpbacks they did not take one. Of their quota of Fin whales they did not take a single one. Of their quota of Piked whales they took 582. We saved the lives of 522 Piked whales and a total of 622 whales of all three species. It was an economic and public relations disaster for the Japanese whaling fleet and their frustration was demonstrated when they threw concussion grenades and shot at our crew, one of the bullets striking me in the chest and a concussion grenade throwing cameraman Ashley Dunn to the deck injuring his thigh. Fortunately my bullet proof vest stopped the bullet and there were no serious injuries from the confrontation. We discovered that we could find them and shut down their operations. Our only handicap was the need to refuel. It takes about 10 days to return to port, a few days to refuel and re-provision and another 10 days to return to the fleet. That was when the whales 583 whales died. If we could secure another ship we could shut them down 100%. And that is our impossible mission for the present. We can and we will return to the Southern Ocean Whale Sanctuary in December with the Steve Irwin. The task now is to find and secure a 2nd fast ship to relieve the Steve Irwin when it is forced to return to port to refuel. Towards that end we are working to raise more funds to purchase a 2nd ship. We also need to raise funds to fuel, outfit and provision two ships. We won't have any problem crewing the ships. We are being overwhelmed by applications. This is a relief because now we will be able to crew the ship from a pool of many individuals of many skills and abilities. Our last campaign was slightly handicapped by a few quitters and a few faint hearted types who did not seem to understand that to be a Sea Shepherd crewmember requires a rare type of passion and courage. If someone is not willing to risk their life for the defense of a whale they don't belong on our crew. And if they don't understand why we would ask that question they don't belong on our crew. I personally believe that taking risks to protect endangered species is far more noble and worthwhile than risking one's life to protect real estate, money and oil wells and they pin medals on people who do that. We fight for life, for diversity and for the future of humanity and all living things and in my opinion that is the ultimate justification for sailing into harm's way. Which brings us to Operation Musashi. Miyamoto Musashi is a legend in Japan and I chose the name because Musashi wrote of the strategy of the twofold way of pen and sword. In other words Musashi knew that in addition to aggressive intervention, it was necessary to communicate and educate. Last year for the first time ever in Japan, the issue of illegal Japanese whaling made the headlines. The reason is that our dramatic and aggressive tactics were news and this enabled us to tag messages to the news stories about the slaughter of the whales. This has brought us support in Japan from Japanese people who oppose the whale killing policies of their government. Our interventions are the sword of direct action and the media is the pen and thus our approach is exactly what Musashi had in mind. A few years ago, everyone told us that fighting the Japanese whaling fleet was a losing cause – the ruthless crimes in the Southern Ocean were being committed by a Yakusa controlled union crewing large ruthless killing machines. The Nisshin Maru was the formidable Cetacean Death Star. The murdering crimes of the whalers were taking place over vast stretches of iceberg studded, frigid, storm tossed hostile seas. We didn't have the money. We didn't have the ships. In other words only a fool would think of venturing into those hostile waters without adequate resources on a Quixotean exercise in futility. But I remember what my friend Martin Sheen once said to me. "Losing causes are the only causes worth fighting for." And enough people have called me a fool to the point that I have no problem believing them and thus striking out on the path of the fool like Don Quixote on a hopeless mission to protect innocence and life was, well to be frank, it was very appealing. And now our hopeless, impossible mission has made such an impact that I now believe we can win this war to drive the criminal whalers out of the Southern Ocean Whale Sanctuary. There is no question that we have the moral high ground. The Japanese whalers are targeting endangered and defenseless whale in a whale sanctuary in violation of international law and the moratorium in commercial whaling. They are sadistic killers involved with the Japanese Yakusa in an industry that has no honour and of no necessity to the welfare of the Japanese people. We are going forth to defend and protect life. We have never injured anyone. We are so non-violent that our ships are vegan vessel. We have never been convicted of a felony crime anywhere in the world. We are volunteers risking our lives to protect life. The Japanese government can call us eco-terrorists and pirates until Mount Fuji erodes away but the fact remains that we fight for life and they kill for profit. In this case the good pirates wear black and our Jolly Roger is a symbol of hope for the whales and for the protection of our oceans. We are pirates of compassion and life in a battle to subdue and defeat the pirates of greed and death. Woody Allen once said that 90% of success was just showing up. In this case he is absolutely right. We just need to continue showing up on the tail of the Japanese fleet, harassing them and intervening against their killing. We need to wear them down by forcing them to endure financial losses every year until they are so far in debt they will have to submit. We can and we will destroy the Cetacean Death Star. We intend to sink the Japanese whaling fleet – economically. Without hurting a single person we can drive their operation into bankruptcy and we can end the killing. Your investment in our operations have and will continue to show results. What is the life of a whale worth to you? Your trust and support for my crew and I will be repaid with the gift of life for the whales and a gift of promise to the future survival of our oceans. Sea Shepherd is best known for their volunteer crews who sail the high seas on board our conservation vessels to protect marine wildlife, and now we need assistance in many ways. Help create awareness of the problems facing our world -- including the destruction and exploitation of marine wildlife worldwide. We provide the materials, you set up a decorative display at an already-arranged event or find a location in your town where you can set up an information table. Hand out information and talk to people about Sea Shepherd — focus on getting new members to join! Use your creative energies to put together a small concert or theme event for the benefit of your favorite charity (SSCS!). If you know musicians or entertainers (comedians, magicians, or other performers) you can easily put together a fun night. You could collect a door charge for SSCS and have an information table inside the event. Participate in protests/demonstrations led and/or organized by Sea Shepherd! Let us know if you are available to meet at a public place or government building to display signs, get petitions signed and get the word out! "Use your creativity to reach out to the public - create billboards and/or signs to educate the public!" Copy and distribute Sea Shepherd info to anyone and everyone that may be interested in helping to protect marine wildlife. Please stress to them that a donation of any kind sent to our main address (P.O. Box 2616, Friday Harbor, WA 98250) would be very helpful, and that for donations of US$25.00 or more they will receive our newsletter and be eligible to crew on our ships SSCS accepts credit cards. SSCS also offers a recurring gift donation plan called the Direct Action Crew - donors can make a monthly or quarterly donation via their MasterCard, Visa, or American Express and from the U.S. or Canada they may use their checking account. See the form on the backside of the Donation Form, which is stapled into the middle of each newsletter. Help distribute our bi-annual newsletter, the Sea Shepherd Log! Each time we print it, we will send you whatever quantity you think you can hand out to potential supporters or place in a prominent public setting(i.e., library, coffee house, book store, scuba or marine shop, etc...). In the never-ending quest to wake up and shake up people into realizing there is wildlife in peril, it helps to get as much media coverage as possible. Send a letter or call your local TV and radio stations, newspapers and magazines telling them about the work that SSCS has been doing for 25+ years. Aside from being a story with a good cause, the footage and photographs are dynamic and exciting, and make for a great show or article. We get many new members from every article, TV show, news coverage and documentary that airs about SSCS. *You can give the media our main telephone numbers (360-370-5650) and we will be happy to provide them with images or video. Keep an eye on our “Wish List” to see what items are needed both on the ship and in the office. Feel free to call the office any time for an updated list. If you are asking someone else to donate an item, be sure to mention that in the United States, Sea Shepherd is what is called a 501(c)(3) non-profit, which means that cash and material donations are tax-deductible. When we receive a material gift, the donor can provide proof of the “fair market value” for which we can issue a receipt. The Society is seeking responsible volunteers with strong communication, general clerical and organizational skills for office work at our HQ, satellite offices, or even from their own home. Volunteers will participate in a variety of projects and general office activities. Please call the office at 360-370-5650 or email volunteer@seashepherd.org to see how you can help in the offices or from your home. SSCS is constantly looking for crewmembers to work aboard our vessels that sail international waters to investigate, document and enforce marine conservation-related laws, regulations and treaties, as well as for other creative conservation work. Crewmembers are chosen by skills, dedication and commitment, and also by the time that they have available. Wherever our ships are docked there is a necessity for people to help maintain and clean the vessels. So, if our ship comes into a port near you, we may need your help. To volunteer to crew on our ships, visit our crewing page and download a printable application. MORE IDEAS...AND NOT JUST FOR STUDENTS! 1. Set up a fund-raiser at your school or in your town (bake sale, lemonade sale, car wash). 2. Write a letter to the editor of your local newspaper or write a report about Sea Shepherd. Conservation Society to help your community, class and teacher learn about an organization of “regular citizens” just like yourself who decided to stop talking about problems and do something active to make a difference! 3. Start a club at school or with your friends -- continue in your efforts to tell more people about what is happening to our world and start taking care of it now. * Plan letter-writing meetings -- Once you learn about some way that marine life is being harmed, learn as many facts as you can, gather all of the addresses of government officials who could help stop the abuse and get everyone to write intelligent, polite and direct letters. In the U.S., write your Senators and Representatives -- to find out whom to write, call 202-224-3121 for Senate Information and 202-225-3121 for House of Representatives information. * Plan events similar to the ones mentioned above (fundraising, dances, parties or video-watching). Thank you for all of your efforts to support Sea Shepherd! The shortfin mako shark is a sleek spindle shaped shark with a long conical snout. This shark has short pectoral fins and a crescent shaped caudal (tail) fin. There is a distinct caudal keel on the caudal base. Its second dorsal fin is much smaller than the first. The teeth are are slender and slightly curved with no lateral cusps, and are visible even when the mouth is closed. There is marked countershading on this shark: dorsally it is a metallic indigo blue while ventrally it is white. The shortfin mako can grow to lengths of 3.9 meters (13 feet). There is still some uncertainty about its life-span, but it is suspected to reach ages of between 11-23 years. As one of the fastest sharks in the ocean, this powerful shark can attain burst swimming speeds of up to 35 km/h (22 mph) and can leap clear of the water to heights of up to 6 meters (20 feet). These qualities have made this species a sought after sport fish in some parts of its range. The shortfin mako feeds mainly upon bony fishes including mackerels, tunas, bonitos and swordfish, but may also eat other sharks, porpoises and sea turtles. Female shortfin makos usually become sexually mature at a length of 3 meters. Developing embryos feed on unfertilized eggs in the uterus during the gestation period of 15-18 months. The 4-18 surviving young are born live in the late winter and early spring at a length of about 70 cm, but have no placental connection during development (ovoviviparity). It is believed that females may rest for 18 months after birth before the next batch of eggs are fertilized. Shortfin mako sharks live in tropical and temperate offshore waters. They are a pelagic species that occur from the surface down to depths of 150 meters (490 feet). This shark is seldom found in waters colder than 16 degrees Celsius. The shortfin mako is found worldwide. In the western Atlantic it can be found from Argentina and the Gulf of Mexico to Browns Bank off of Nova Scotia. In Canadian waters these sharks are not abundant as they prefer warm waters, but neither are they rare. 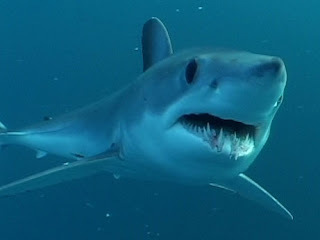 Shortfin makos are often found in the same waters as swordfish as they are a source of food and both fish prefer similar environmental conditions.